Iceland has really interesting traditions on how to celebrate Christmas holidays. First of all it should be mentioned, that the name of the holiday is Yule or Jóladagur and instead of Santa, Icelanders have 13 Yule Lads. They don’t have any connections to Santa Clause, these descendants of trolls were used to frighten kids, but recently they became kinder. Nowadays, Yule Lads arrive on December 12 and leave on Yale Eve, their main function is to give kids small presents. Children leave their shoes near windows, and if they behave well, they would receive gifts, but if they were naughty, they would find a potato in their shoes! Usually Icelanders put on Christmas tree on December 23, the day when biggest Saint in the country heilagur Þorlákur Þórhallsson died. During this day, also known as Þorláksmessa, people go on last minute shopping, as the stores are closed only at midnight. Christmas Eve celebration starts at 6pm, one of the reason might be that long time ago a new day started at 6pm not at midnight. Traditionally after the evening meal Aðfangadagur, children would open the presents and the full celebration will begin! Icelanders prefer to celebrate Jóladagur with their families. Traditional food is a leg of roasted lamb. Another important Christmas meal is Laufabrauð, it is a leaf bread, that families eat during Yule day. Of course celebrations continue on boxing day, as traditionally Yule Eve and Yule Day are more private holidays, when you won’t see people celebrating these days on public, Annar Jóladagur is a prefect opportunity to meet with friends and party all day long! 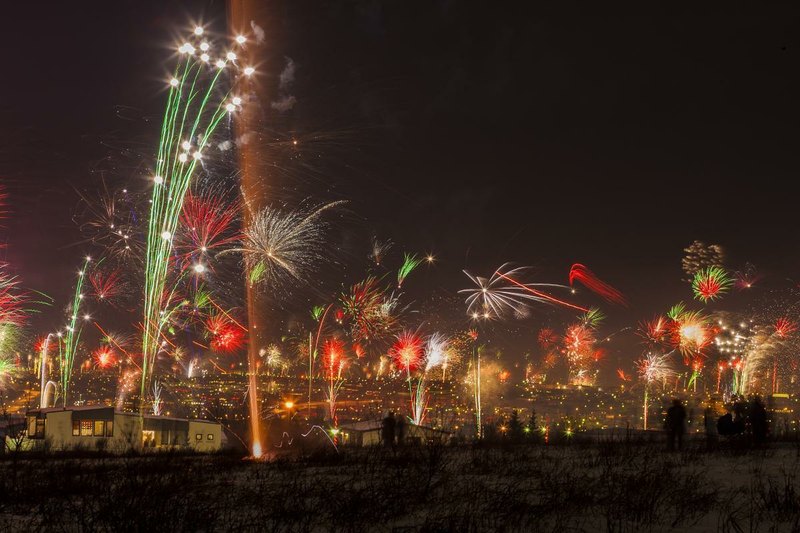 New Year Eve as well as New Year day are very important days in Icelandic traditions, huge bonfires lit during the celebration. Also these nights are considered magical and there are legends that during this time cows are able to speak, seals can take a human form and dead people can come from the graves. Certainly fascinating days to be in Iceland! The last day of the celebration is a Twelfth Night, during this day people lunch colourful elf bonfires and do traditional elf dances.